If you want to see, hands down, the most impressive costumes anywhere, join up with the Society of St Anne. They gather in the Bywater around Piety St & Burgundy St, and usually roll around 9am (or so). 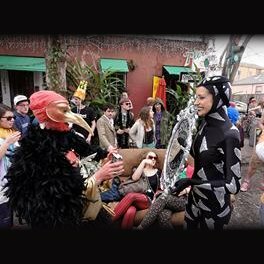 This parade traditionally attracts the most crazy creativity of any Mardi Gras moment, and parades through the Marigny and Quarter to the Mississippi River.